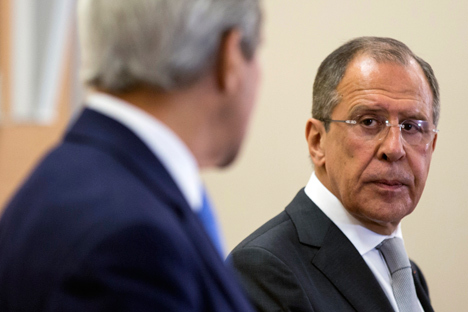 Russian Foreign Secretary Sergey Lavrov looks at U.S. Secretary of State John Kerry. The U.S. Embassy in Moscow has received a note from Russia’s Foreign Ministry over the restricted access for Russian diplomats to observe elections in the United States, spokesperson for the U.S. Embassy in Moscow Maria Olson said on Nov. 8. "We received an Oct. 26 MFA dipnote about election observation," she said. After America votes: What awaits Russia, post-Nov. 8? As the U.S. diplomatic mission said, "Russian assertions that they the U.S. government is barring them from observing the elections are simply unfounded." According to the U.S. Embassy spokesperson, "the Russian Federation was invited to join the OSCE delegation, both the long-term and short-term observer groups." "In addition, U.S.-based Russian Embassy personnel, along with the U.S.-based Embassy personnel of all OSCE participating States, were invited to join the OSCE short-term observers. Russia has chosen not to participate," the spokesperson said.